Thailand has many different modes of transport which tend to come in all different shapes and sizes. These shapes and sizes are often quite different in the smaller towns and cities compared to that of Bangkok. Bangkok in actual fact has everything when it comes to transport and a great variety of the different modes of transport to meet everyone’s needs. 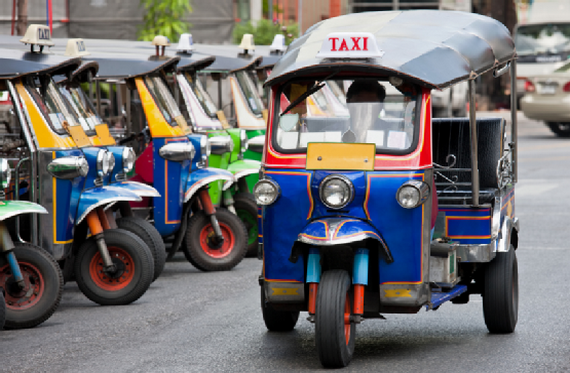 This transport guide covers everything from Songthaews and motorcycle taxis to the Bangkok BTS Skytrain and world-renowned Tuk Tuks. This is your easy guide to transport in Thailand. The most indigenous mode of transport in Thailand, Tuk Tuks are the famous 3-wheeled vehicles that you would have seen in many travel-related photos of Southeast Asia. You should definitely take at least one ride on a Tuk Tuk as it is quite a memorable experience that you won’t find back home. 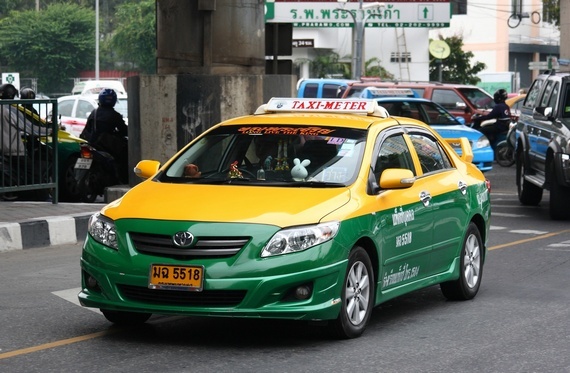 With Bangkok being the most visited city in the world in 2013, it consequently has one of the largest proportions of taxis to people in the world. Unlike in the big Western cities, Bangkok’s taxi system is very reasonable thanks to the metre system that was recently introduced several years ago. Taxis start at 35 Baht and thereafter 2 Baht for the first 2 km and then 2 Baht per km after that. The traffic in some areas in Bangkok can however be appalling so motorcycle taxis might be a better bet if you are only wanting to travel a short distance in Bangkok. Taxis are however air-conditioned which can make for a nice break from the ridiculous Bangkok heat. Motorcycle taxis are your best bet if you are looking for cheap and immediate transport for short distances. They can be found in most Thai cities throughout the country as well as smaller towns with good transport systems. Obviously when travelling on the back of a motorcycle, it is not ideal if you are carrying with you a lot of luggage or if it is raining quite hard but otherwise this is probably the best mode of transport for the everyday backpacker. The name “songthaew” literally translates to “two rows” in English. Basically, Songthaews are small pick-up trucks which are comprised of 2 rows of seats at the back end of the vehicle for passengers to rest their legs on. There is also some limited space right at the back of Songthaews for people to stand and hold on to – Songthaew drivers do drive reasonably slow making it rather safe but please do remember to hold on. 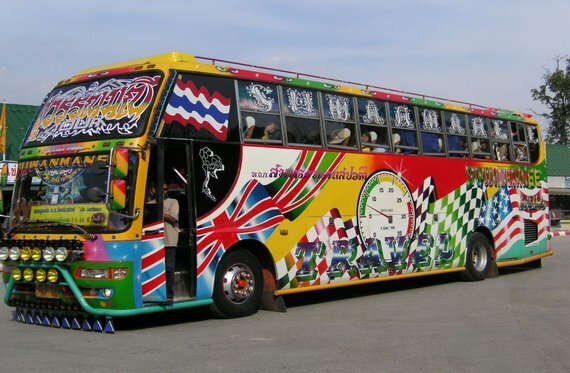 Thailand has a developed bus transport system and unsurprisingly, Bangkok has the largest bus system in the country. When it comes to getting around within the majority of smaller cities and towns, Songthaews are usually the norm as opposed to buses but many of the smaller cities do have bus systems that provide long-distance transport to other towns, cities, and popular tourist destinations. In Bangkok, you will find a variety of buses of all different sizes and colours some of which are public and others private buses. Your cheapest bus option will cost you a mere 7 Baht within Bangkok with other buses not costing too much more than that. There are long-distance buses departing from Bangkok to all over the country such as Pattaya, Hua Hin, Krabi, Phuket, Chiang Mai and so on. This is often a great alternative to flying or catching the train if you are on a tight budget. Over recent years and due to the over-congested roads in Bangkok, city planners have developed both an overground and underground train network through the city. The BTS Skytrain is an overground railway system comprised of the Sukhumvit Line and the Silom Line. 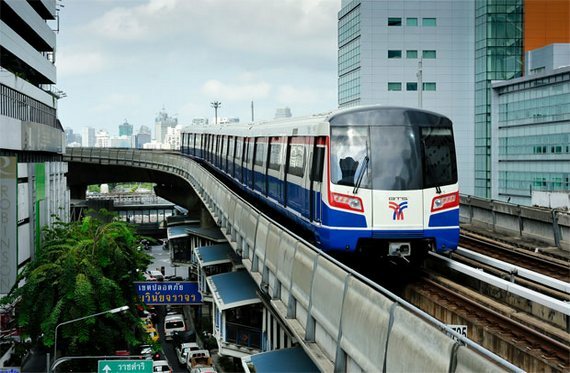 The MRT Subway, otherwise known as the Blue Line, is the first underground railway line to be introduced to Bangkok’s railway network. It is comprised of 18 stops and follows a slightly different route to the BTS Skytrain which allows travellers to commute via train to the inaccessible neighbourhoods of the Skytrain. Thailand’s overground railway network runs throughout the country and offers a comfortable travel option compared to some of the cheaper bus routes. The train is still a cheap option and you can get from Bangkok all the way to Chiang Mai in the north for as little as 800 Baht where you can get your own private cabin and take in the exquisite scenery that accompanies this journey. The Thai train also has three different classes with different rates. To put into comparison the different train classes and their rates compared to other long-distance modes of transport in Thailand. First class is very fancy on a train which includes a private air-conditioned cabin with a double bed and can be slightly higher in price to a budget air ticket. Second class train tickets are slightly more comfortable to first class bus tickets and generally cost the same as first class bus tickets. Third class is the cheapest mode of transport for any long-distance journey in Thailand however it is also the least comfortable so keep that in mind. Please note that train tickets tend to sell out well in advance for popular weekends and holidays, especially for trains travelling to the more popular destinations, so plan your trips in advance if you wish to travel by train. For information on Thailand’s train network. Travelling by air in Thailand is definitely the quickest way of getting from A to B and there are a lot of budget airlines which cater for those travelling on tight budgets.